A while ago we bought frozen sea scallops from Costco. We have been disappointed in them. Even though there is no indication on the label that they have been treated with tripolyphosphate, they ooze that telltale milky liquid and refuse to get a good sear. Sea scallops are not cheap and I needed to find something to do with them. I thought breading and frying them might work and it did! They came out moist on the inside and crispy on the outside. Now we never make fried food except when John makes latkes at holiday time. And frying is definitely not dining light. However, at least it was shellfish which is about as low as you can go calorie-wise for a protein. I still have another big bag of them so I am thinking of having a family dinner to use them up. 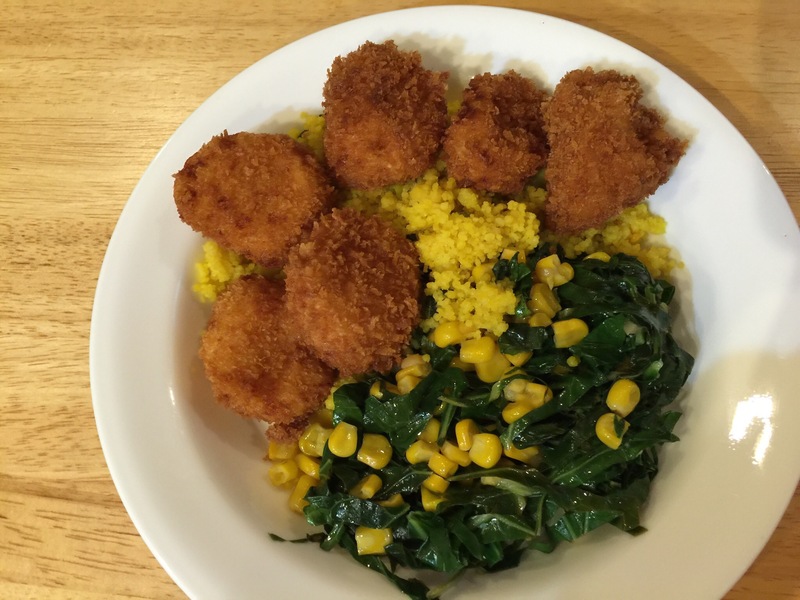 This entry was posted in pescatarian, Shellfish and tagged collard greens, corn, couscous, Fried scallops, scallops. Bookmark the permalink.